Premium Salli Swing with standard options. Anatomical split-seat saddle rocks and tilts, following the body's natural movements to reduce postural strain. Seat height options for short, average, and tall users. If you would like to be notified when this item becomes available, please contact us or put this item in your Wishlist. Salli Swing Care is the standard version of the Salli Swing. The two models are the same except that the premium model has different upholstery options and a metal 5-star chair base. The saddle "swings" and tilts in every direction, following the body's natural movements to reduce postural strain. Even small movements will stimulate muscles in the abdominal and pelvic area, similar to sitting on a gym ball. In line with the environmental message of the Salli Care design, the upholstery utilizes leather remnants left over from the production of other chairs, stitched together in an attractive design. The remnants display visible wrinkles, lines, healed minor cuts and scratches. These are not defects, but rather natural characteristics of the hide. The leather surface is unbroken and the marks do not affect durability. Anatomical split-saddle with center gap. Responsive 360° free-float saddle movement. Heavy-duty 3 mm steel seat plate. Commercial-quality leather upholstery meets stringent CA TB133 flammability standards. Leather is stitched from remnants for economy and to reduce environmental waste. Large 65mm casters for easy maneuverability. 4 seat height options for short, average, and tall users. Salli Saddle Chair Comparison Chart. Swing: Salli saddle chairs with fluid seat motion are suitable for most folks of average build. Unfortuantely, the swing motion often does not work for those with anatomical characteristics at the ends of the bell curve (e.g., petite, big, generous hips or thighs, etc.). In those cases the user’s body weight may not not center over the axis of motion under the seat, which interferes with the seat’s ability to follow the body’s movement. The end result can be poor body postures. Tilt: Tilt mechanisms offer greater range of movement in a forward/backward tilt direction than is available in a Swing mechanism. For this reason, Salli saddle chairs with manual seat tilt adjustment can accommodate the needs of almost any body type. There is no research to indicate whether "swing" or "tilt" saddle motion is superior from a health or task perspective. The physiology of conventional sitting is quite different from the "supported standing" posture one assumes on a saddle stool. We don't yet know whether the research related to seated movement applies in the same way to the high perch straddle posture one assumes on a saddle stool. Some Salli's with swing motion can be converted to a Salli with manual tilt and vice versa, by replacing the adjustment mechanism under the seat. Please contact us for details. See videos of the Salli Saddle Chair being used in the office, at home, in industry, and by health care professionals. How to choose the best chair for the task. Who uses a saddle seat? Which saddle seat to choose? Useful tool set for detaching a pneumatic cylinder from a chair base and seat without damaging the chair components. Package includes two tools in a leather bag. Polyurethane-coated elastic fabric is water resistant. Ideal for industrial work in moist environments. Available for all Salli Saddle Stool models. Seat cover for the Salli Salli chair is treated to resist ignition from open flame. Ideal for welders. Available for all Salli Saddle Stool models. 100% cotton seat cover for the Salli Saddle Stool keeps your seat clean and cool in dirty, hot environments. Available for all Salli Saddle Stool models. High quality leather and synthetic seat covers for Salli Saddle Seats with a two-part saddle. Fits so perfectly, it looks just like the original upholstery. A great way to redecorate without buying a new chair. For Salli Twin, Multiadjuster, Swing, Strong, and more. Foot ring supports the feet for seated work at high counters and workbenches. Also for dental assistants and similar high-reach hand tasks. Large 20'' diameter is suitable for both saddle chairs and conventional drafting stools. Attaches to the Salli Saddle Chair to provide versatile body and arm support for precision work. Recommended for surgeons, dental assistants, and sonographers. 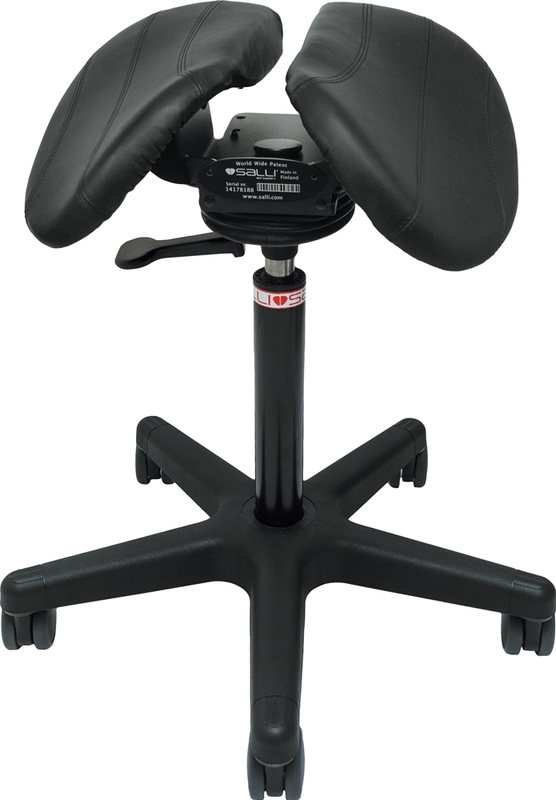 Also compatible with the Bambach Saddle Seat and similar saddle chairs. Low* 4' to 5'2" 18.5"-23"
Intermediate* 4'10" to 5'6" 20.5"-28"
Medium 5'1" to 6'1" 22.5"-30"
Tall 5'8" and over 25"-35"
Lifts marked with an asterisk (*) are not available on some Salli models. Body height recommendations are approximate and vary with body proportion, height of shoes, riding style, etc. Actual seat heights vary depending upon caster size, chair mechanism options, base style, etc. Size down 1" - 2" if body proportions are "long torso with short limbs." Size up 1" - 2" if body proportions are "short torso with long limbs." Important! Do not turn the wrench more than 1/4 turn at a time when loosening the seat tilt tension. If you do not feel seat tension getting lighter after a couple of tries, please Contact Us for more troubleshooting tips. Ten (10) years for upholstered chairs (e.g., Salli Swing, Swing Care, SwingFit, SwingFit Care, Multiadjuster, Multiadjuster Care, Twin, Twin Care, Classic, Strong), including the seat, casters, tilt mechanism, lift, and base. Two (2) years for non-upholstered chairs (e.g., Salli Pro), including the seat, casters, tilt mechanism, standard pneumatic cylinder, and base. Two (2) years for chair accessories and pneumatic foot-control assembly. See the Salli Instruction Manual (Finland) for complete warranty information. Five (5) years for upholstered chairs (e.g., Salli Sway, Chin), including the seat, casters, tilt mechanism, standard pneumatic cylinder, and base. Two (2) years for non-upholstered chairs (e.g., Salli Job), including the seat, casters, tilt mechanism, lift, and base. See the Salli Instruction Manual (China) for complete warranty information. Falling, dropping, or abrasion of product. Piercing, impressions, or marks made by contact with hard, rough, or sharp objects. Pets or any other inappropriate use. Any and all amendments attached to the product or alterations made to the product, other than those approved by Salli in writing prior to assembly. The chair must not be used or stored in temperatures lower than + 5 °C. The purchaser's sole claim shall be for repair or replacement, at the sole option of Salli Systems / Easydoing Ltd., of any defective product covered by the warranty. This item will be hand-crafted to your specifications in Finland. Lead times may vary depending on the production queue. Please contact us for current lead times. Standard Delivery is free to the contiguous USA. Allow 3 to 6 weeks (give or take) for production and delivery. Larger items and items with accessories may ship in 2 or more boxes. Full refund of the purchase price for Salli Saddle Chairs returned within 30 days in new, unused condition in original packaging. Once a chair has been removed from its box and assembled, it is considered "used", as there is no way to disassemble a chair without leaving some marks. Partial refund for Salli saddle chairs that have been used. Try a Salli as long as you like. Return it in good condition, and we'll refund the purchase price less a $35/month rental fee or a 20% restocking charge, whichever is greater. No returns on Slipcovers once used. No returns on Special Orders or Salli Accessories. We do not refund shipping charges except in case of our error or product defect. If your purchase included free shipping, actual outbound shipping costs will be deducted from your refund. Salli chairs can cost us over $50 to ship one-way from coast-to-coast and $200 to ship from Finland, so please keep this in mind when considering your return options.